Round cribs are a fabulous start if you are looking for a way to turn your baby nursery into a wallowing wonderland for your baby. There is something magical about a round crib with valance, bumper and skirt that gives the illusion of a faraway fantasyland. No matter which fairytale you plan to drift away on, round cribs come in a style to match. Round cribs are not that readily available, but they can be found if you know where to look! Csnbaby.com stocks a good selection of Stokke round cribs, while ababy.com stocks Angelline and others. They are available in numerous colors and finishes, with a canopy or without. You can order hardwood or metal and handpainted panels to match your theme. And they come with all the convenience features of standard baby cribs for mom, plus a few extra little bouncy baby bonuses! Because you can reach a round crib from all sides, changing bedding is a breeze. Great for accidental leakages at 3am - yes - they do happen! Drop-down rails on one or both sides of the crib - Allowing easy access, you can even change or dress your baby in the crib. An adjustable mattress support - Allowing you to lower the bed as your baby grows (and grows!) This feature is worth its weight in gold - believe me. You will soon find out that babies become VERY frustrated from boredom at this age. Anything you can do to alleviate the boredom for baby, is a sanity saver for you! A canopy on the crib falls into the same category. The more there is to look at, the better. Round cribs give baby more room to bounce! The regular round crib mattress, measures 42 inches in diameter, whereas, a standard baby crib mattress, measures 27 1/4 by 57 5/8 inches. In a round baby crib, baby does not feel restricted as he does by the narrow width of a standard crib. Good news for bored bouncers! Round cribs placed in the center of the baby nursery, give baby an all round view of the room. Not essential for a newborn, I admit, but great for a curious six-month old. On a more serious note, the tendency of young babies to get 'stuck' in a corner of the baby crib is a recognized SIDS risk. Baby's mouth and nose can get wedged up against the crib corner or the mattress. Baby breathes and re-breaths the same air until the oxygen level is depleted, resulting in suffocation. Obviously, with round cribs, this is less likely to occur. Baby is always nestled in the safety of a gentle curve. Are available in a variety of styles. Are available in wood or metal. Come with or without canopies, posts and decorative finials. Are available in a wide variety of finishes. Some companies even give you the option of customizing your crib with your own colors and artwork. So, no matter what color scheme or nursery theme you are planning, you can find a round baby crib to fit your decor. Unfortunately, these snug baby nests do come with their fair share of drawbacks. But don't stress! - Most of them can be overcome, or even ignored, if you have your heart set on a round baby crib being the focus of your new baby nursery. Round Cribs are more expensive than standard baby cribs. On the plus side, some of them include a round crib mattress as part of the deal. Remember to take this into account when performing price comparisons, as a round crib mattress can be fairly costly. 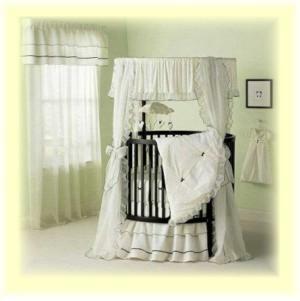 To make the most of a round crib, it should be placed in the center of the baby nursery. The floor space requirement for this setup is substantially more than for a traditional "crib-against-the-wall" approach. If you have the space - good for you. Scratch this little snag from the list. If (like most of us) you are not so lucky (my baby nursery is just about the smallest room in the house!) you can always tuck your crib away in a pretty corner. It will still look good, but realize that you will lose many of the benefits of the round shape, while still laying out the extra cash - your choice. Because of the shape, these cribs do not come with the convertible option available with many standard baby cribs. However, it is up to you to decide whether or not this is an issue. If you are planning more babies - cool - they all get to sleep in the lap of luxury! Most round cribs measure between 45 and 55 inches in diameter. This is great for a bouncy baby as he has more room to move. However, because a standard doorway is only 32 inches in diameter, you will have to disassemble the crib to move it to another room. Again - not a train smash if you don't mind the inconvenience - how badly do you want a round baby crib? Since these are not that easy to get hold of, I would suggest buying your round crib mattress with your crib. Most retailers sell mattresses with round baby cribs either as part of the price or as an optional extra. If for some reason you decide not to do this, or if you already have a round baby crib and are looking for just the round crib mattress, you can buy one from ababy.com. Round baby cribs are certainly special. They can turn an ordinary room into an extraordinary wonderland. Let's go shopping for round baby cribs! Please be aware that the baby cribs information provided by Creative Baby Nursery Rooms is for the purpose of helping you to decide on the best crib for you. Upon making your choice, it is your responsibility to ensure that your preferred baby crib adheres to the CPSC standards in crib safety.